Table saws are an essential tool in the workshop, but it can be a very dangerous tool. It is super important that you know how to use a table saw safely, and in a safe environment. First off, it should go without saying that you should read the manual of your particular table saw before attempting to operate it. Make sure you have the correct blade that is sharp and ensure it is seated and tightened properly. If your table saw is new then it will be safe to assume the blade is sharp, but check anyway. Dull blades can be a problem in the way that they can bind in wood and cause kickbacks. If you have bought a second hand table saw then it is especially important that you check the blade for sharpness. ALWAYS wear safety goggles when using a table saw. You should also check if the blade guard is functioning the way it should be. Even if your table saw is brand new out of the box you should make checks and ensure all the bolts are tight. They can become loose in transit so its always good to check. If your table saw doesn’t have a blade guard it goes without saying that you should take extra precautions, and maybe search on YouTube for a video on how to make your own table saw blade guard. Make sure your table saw blade and fence are true. There are a few ways of ensuring the blade and fence are square, the simplest way would be to draw a perfectly straight line down a piece of scrap wood then running it through saw ensuring the wood always sits flush against the fence. If the saw cuts the whole way down the line then you are good to go. In time you will learn new techniques to achieve the the same result but this method will always work. Before you use a table saw you should ensure that anything your wearing can’t get caught in the blade. This could be loose fitting clothing, a necklace, bracelet or even long hair. Any of these things can get caught in the blade and possibly cause you to be pulled into the blade. If you have bought a second hand table saw its worth checking that any and all buttons and wires are in a safe condition. Table saws generally take a lot of abuse when being dragged from one job site to another and wires especially can become scuffed and damaged so its always a good idea to check they are in a safe condition. It also goes without saying that wires should be well out of the way when operating a table saw. Always keep your table saw blade at a sensible height for each piece of wood you cut. If you keep the blade as low as it can go while at the same time completing the cut you shouldn’t run into much trouble. If you have the blade much higher that the thickness of the wood you run the risk of a nasty kick back. The fewer teeth in the wood at any given moment the more friction there will be. Table saws reach maximum RPM pretty quickly but its good to wait a few seconds just to be sure. Under no circumstances should you run the wood into the blade before its reached maximum RPM. Also, make sure the blade can handle the RPM of the table saw itself. It will say on the blade what its maximum RPM is, if this matches your table saw’s RPM then you are good to go. If you work with wood often (especially reclaimed) you will probably check the wood you acquire for nails, staples, pins and knots without even thinking about it. 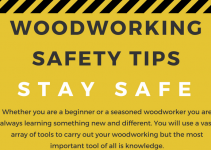 But if your new to working with wood you might not think to check so its important you get in the habit of checking wood as soon as you acquire it. nails and staples can be removed easily but sometimes you cant avoid a knot or remove it for whatever reason. When this is the case take extra care when cutting through one. When running wood through the table saw i personally like to stand off center or even to the side of the blade well away from the back end. That way if there is a kickback you wont be there to take the hit. I have been on the receiving end of kick backs a fair few times and let me tell you, when a piece of wood hits you directly on the hip bone at speed it hurts! A very helpful tool that can’t be championed enough is a push stick, these simple to make tools remove the need to reach and get close to the blade. While using a push stick on a table saw the temptation is there (especially if your new to working with table saws) to drive the wood into the blade, you should not do this, you need to just simply feed the wood to the blade. Driving the wood into the blade will cause too much friction which in turn will result in a kickback. Push sticks are easy to make, i particularly like this push stick design by hffcom over on YouTube. To get a nice clean cut ensure the wood is sitting flush with the fence prior to feeding it into the blade and while making the cut. Use your push stick to help you keep it firmly in place while making the cut. Consider getting an out feed table if you don’t have one or simply have another person on the other side to help you. If your making a cut that doesn’t require cutting all the way, ensure you allow the blade to stop fully before removing the wood. Because your not making a cut the whole way through there is more margin for error when trying to remove the wood from the table, accidentally chipping the edge of a beautiful piece of pine would be most annoying. Wearing Safety equipment should be mandatory when using powerful tools. Especially tools like table saws. You should ensure you wear appropriate safety gear such as eye goggles, ear protection and clothing appropriate for this type of work. These items are not expensive so should not be left out when buying a table saw or any other potentially dangerous tool. I should probably mention gloves, gloves can be helpful in the way that they help prevent splinters but i find gloves make me feel less safe, im not sure why, maybe its because i feel safer if i can feel everything with my own bare hands. If you feel safer with gloves on then by all means wear them. 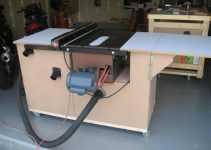 Looking for a new table saw? Check out my table saw reviews in the menu above or on my home page.